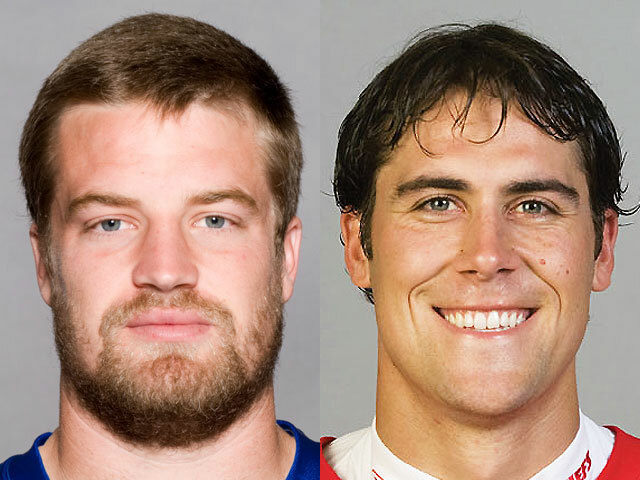 A new study suggests Ryan Fitzpatrick's (left) Buffalo Bills are more attractive than Matt Cassel's (right) Kansas City Chiefs. (CBS) Which NFL team is the best? It's way too early in the season to know, but a wacky new study says it's identified the team that's the best-looking. For the study, the Wall Street Journal enlisted researchers from Ursinus College in Collegeville, Pa. to analyze facial symmetry of NFL personnel. For each of the 32 NFL teams, researchers picked five offensive players, five defensive players, and also the oft-photographed head coach and team owner, and ran their pictures through a computer program. Which NFL team was deemed the most attractive? The Buffalo Bills ranked number one - yes, even including 92-year-old owner Ralph Wilson, and 59-year-old head coach Chain Gailey. "My wife will be shocked," Coach Gailey told the Journal. Which team was deemed least attractive in the symmetry study? The Kansas City Chiefs. But don't call a Chiefs player ugly. The vast majority of NFL players studied ranked 10 percentage points higher in facial symmetry than the average Joe. "I am surprised that NFL players are so symmetrical to begin with given the roughness of the sport," Dr. Coren L. Apicella, research fellow at Harvard Medical School, and co-author of a 2008 paper on facial symmetry's role in sexual selection, told CBS News in an email. "All it takes is one brutal game to turn a pretty face into a lopsided one." What do the teams say about the study? When reached by CBS News, a Chiefs representative had no comment. He cited a more pressing issue for the Chiefs - their season-opening game on Sunday - ironically against the Bills. The Bills are sitting pretty after that contest, beating the Chiefs 41-7. The study didn't only pit teams against one another. When ranking players by position, the study found kickers, and not quarterbacks - like recent GQ cover boy Mark Sanchez of the N.Y. Jets - were the most attractive players in the NFL. "Given the brutality of the sport, it is less surprising that kickers are more symmetrical than quarterbacks," Coren, who was not involved in the study, said. "Perhaps then, the Buffalo Bills, who are the lowest ranked team but who have the prettiest faces, are just not in it for the fight." The study may sound silly to some, but it's "certainly based on scientific theory," Dr. Anthony Little, a psychology research fellow at the University of Stirling, U.K., and author of several facial symmetry studies, told CBS News in an email. Little said symmetry studies on humans, animals, even insects, suggest a correlation between greater symmetry and evolutionarily-desired traits like good health and ability to produce more offspring. He's not sure he buys this study's results though. "I think the idea that attractiveness is only about symmetry is a little simplistic as there are many other factors that contribute to attractiveness in humans," Little, who was not involved with the study, said. What do you think? Click here to look at pictures from the "most attractive" Buffalo Bills and "least attractive" Kansas City Chiefs.